In case you haven’t heard, the series finale of Lost aired on Sunday night and brought to a close the story of the survivors of flight Oceanic 815. Many viewers enjoyed the last episode but there were others who felt confused, frustrated, and tricked by the producers. It turns out that part of their frustration isn’t the producers’ fault. Lost, as most everyone knows by now, follows the story of a diverse group of people who crash land on a very strange island. Many actors have come and gone in the show’s six seasons but the final regular cast includes Daniel Dae Kim, Emilie de Ravin, Evangeline Lilly, Jeff Fahey, Jorge Garcia, Josh Holloway, Ken Leung, Matthew Fox, Michael Emerson, Naveen Andrews, Nestor Carbonell, Terry O’Quinn, Yunjin Kim, and Henry Ian Cusick. To the delight of many fans, “The End” also includes appearances from several performers from past seasons, including Maggie Grace, Ian Somerhalder, Elizabeth Mitchell, Jeremy Davies, Cynthia Watros, Dominic Monaghan, Rebecca Mader, John Terry, L. Scott Caldwell, Sam Anderson, Sonya Walger, Francois Chau, Fionnula Flanagan, and Neil Hopkins. 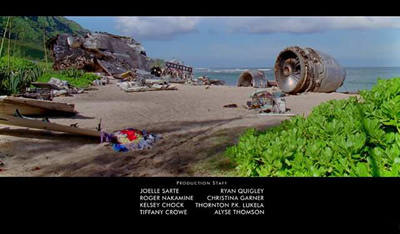 While the end credits rolled on the Lost series finale, viewers were shown images of rusting plane wreckage on a beach. Some understood this to simply be the remnants of the Oceanic 815 crash. Others read more into it, thinking that this indicated that no one had survived the initial crash or, that the escape plane with Kate, Sawyer, and the others had crashed. Does this change how you feel about the Lost finale? We now know that ABC, and not the producers, added those images. The network apparently wanted to soften the transition between the ending and the local news and didn’t consider that they might be misinterpreted. So, to review… what happened on the island, happened. Jack died on the island at the end of the story. Hurley became the new Jacob and Ben helped him. Kate and friends flew back to the mainland. The alternate story that we saw in season six was the place the survivors created so they could reconnect in the afterlife after they had all passed on, in their own time. ABC messed up. End of story. What do you think? Does ABC’s admission change your feelings about the last episode? Make things more clear? More about: Lost, Lost: canceled or renewed? Lost: The Answers are Coming… to Your Local Bookstore? I didn’t watch the finale is America so didn’t see the picture of the rusting wreckage (above). However, I like it and think it was a nice touch. Does anyone know if the prop wreckage is still on the beach in Hawaii as a tourist attraction? @Paul Reddington: I don’t think so. I believe it was removed and a bunch of it was sold at an auction for charity. I loved the entire series,even the finale. But it did leave quite a few questions unanswered. I think we all should write and pressure the producers to come up with something to tie up all of the loose ends. Its a TV Show , get over it ! Ohhhh so Lindelof, Cuse, Abrams and the rest of the reprehensible, villanous liars who are hiding like coawrds behind a “full-media blackout” are blaming thier network……..
Hey it’s not my fault! Blame my boss! It doesn’t matter anyways. As a result of the LOST series finale I have blocked ABC on all of my televisions using parental controls and when I see the name Lindelof , Cuse or Abrams associated with media outside ABC I will not waste my time with it………. There is too much good stuff out there to bother with this utter garbage …………..
Who cares about a stupid picture shown in the credits?! Of course it doesn’t change my feelings – that the whole show had huge potential but was totally ruined and became quite ridiculous towards the end. The final episode was just as I expected – bad. Like the whole series. If season 6 wasn’t the last one, I wouldn’t have even watched it – I only watched because I said to myself – well it’s the last of LOST, so let’s just see how it ends and get done with that terrible show.